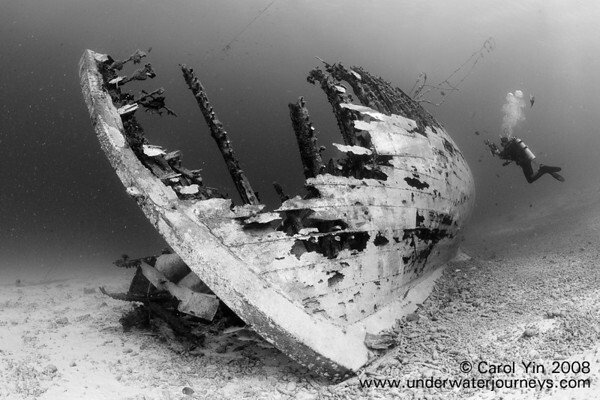 Wreck photography can be challenging because of the size of a wreck, and the limited ambient light. The best lenses for wrecks are ultra-wide lenses such as a 10.5 or 10-17mm fisheye, or a 10-20 rectilinear. When inside a wreck, good buoyancy and fin kicking technique (frog kicks) are important to avoid silting up the area. In low light photography, a compromise must often be made between shutter speed, ISO, and aperture. Check your shot to make sure all of the photo is in focus, and there is no camera shake blur. Adjust settings if needed. Manually focus to the hyperfocal distance for maximum depth of field. Take advantage of sunbeams, diver’s lights, portals, etc. Shooting from the interior of a wreck is an excellent ambient light choice. Ambient light is often the best choice for capturing the entire wreck. Obviously a wide-angle lens in needed for this shot. Filters can be used to bring out the colors of wrecks. Keep in mind that you will lose 1 to 1 ½ stops of light, so proper setting of ISO, shutter speed, & aperture will be even more important. With a wide-angle lens, you might be able to hold still as slow as 1/15th of a second, but multiple shots may be needed. 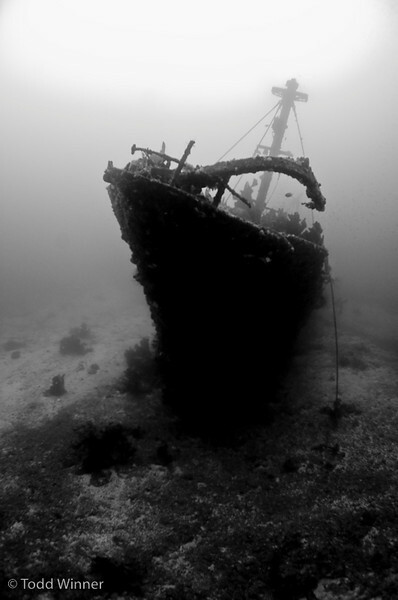 Black and white photography is often an excellent choice for wrecks. Emphasis strong shapes, form, and contrast. Expose for details in the wreck. Here is more information on shooting black and white underwater. Betty Bomber, Truk Lagoon. Nikon 12-24mm, 1/125th, F10, ISO 400. Photo by Amanda Cotton. "Attempting to find a different POV was a bit challenging on the bomber since it has been widely photographed. Shooting from the rear changed things up a little for me." This is the Our Confidence while diving Bonaire. Canon 5D, Canon 17-40mm (at 17mm), 1/125th at F4.5, ISO 200. Photo by Carol Yin. Carol says "This image actually had a lot of backscatter on the left side, but by manipulating the color channels independently I was able to minimize the white flecks." Editors note - When shooting wrecks from far away, don't forget to turn off your strobes. 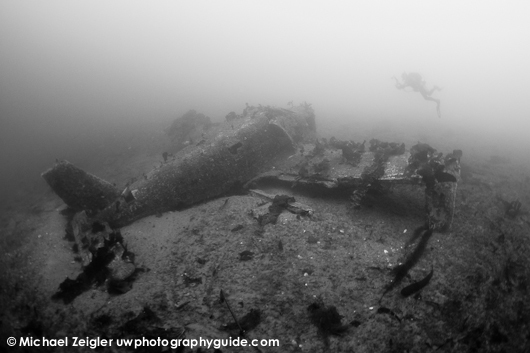 This Piper Warrior wreck was shot in 125fsw while diving Catalina Island, CA. NIkon D90, Tokina 10-17mm FE (at 10mm), 1/8th at F3.5, ISO 800, ambient light. Photo by Michael Zeigler. 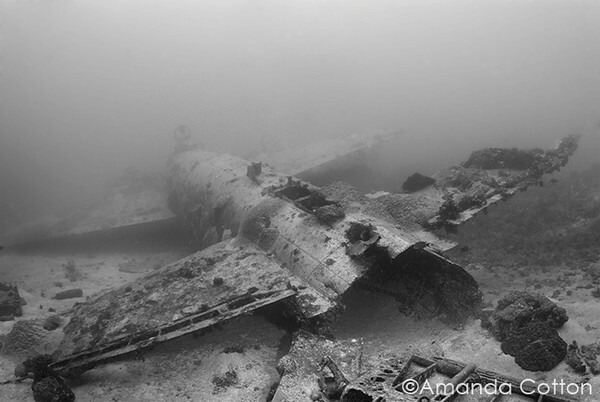 "I had been to this wreck once before, so I had an idea of how I wanted the shot to look when I touched down at 125'. It was also important for me and my buddy to be first down to the wreck. Just seconds after I took this shot (3rd of 3 shots), the visibliity and silhouette changed greatly as the other divers on the charter descended to explore the wreck." Shipwreck in the Catalina Island dive park, photo by Scott Gietler. 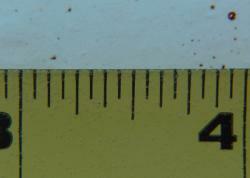 F5.6, 1/25th, ISO 250. Nikon D80, 10.5mm fisheye lens. Even at 1/25th, a wreck photo can be sharp when shooting very wide. I converted this to black and white which brought out the detail nicely. Diagonal compositions often work well with wrecks. 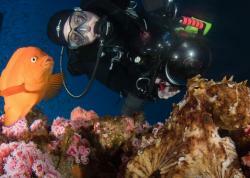 Close-focus wide-angle (CFWA) is a great choice for soft-coral encrusted wrecks. Get as close as possible to your foreground subject, and examine different angles for different backgrounds. Check histograms and displays for even lighting, backscatter, and hot spots, and reshoot if necessary. Wreck interiors are also great choices for CFWA, with ambient light from outside of the wreck acting as a good background. Good buoyancy and fin kicking technique (frog kicks) are important to avoid silting up the area. Push your strobes out far to the side to reduce backscatter. When shooting wide angle with strobes, please remember it’s difficult to light up an entire wreck with strobes. Color and contrast is lost once you are more that 2-3ft away from your subject. Backscatter and uneven lighting is an issue. Beginners often try to do this, but I recommend using one of the other techniques above. 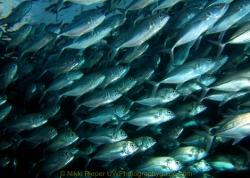 Read more about CFWA underwater photography. Japanese fishing wreck, Bali. Nikon 10.5mm fisheye lens, F10, 1/125th, ISO 100. This wreck had beautiful colorfil corals all over it, my 10.5mm fisheye lens allowed me to get within 3-4ft of the wreck, I still lost a little a touch of the reds, but I was still close enough to bring out most of the colors. Research the wreck before hand to find out where the best photography areas are. Bottom time is often very limited on deeper wrecks. Shoot ambient light to get shots of the entire wreck, and then turn on the strobes for CFWA. Push strobes out far to the side, and point them straight ahead or slightly out to reduce backscatter. Dive the site repeatedly to think about the best shots you can get on the wreck. 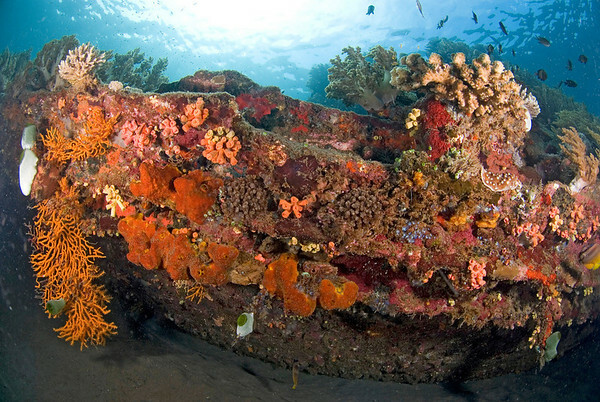 Wreck of the Ann, photographed while diving Solomon Islands. 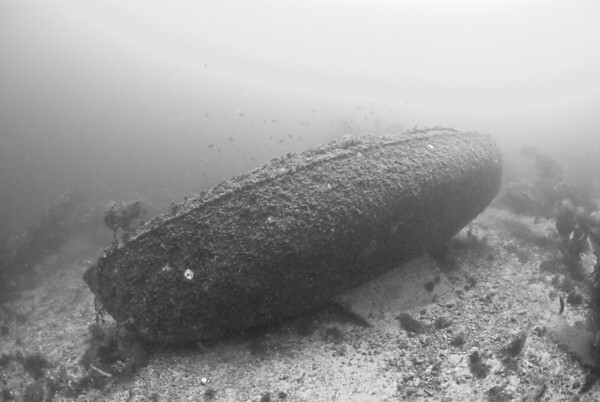 A nice high-contrast wreck photo with a lot of detail and a well defined shape. Photo by Todd Winner. 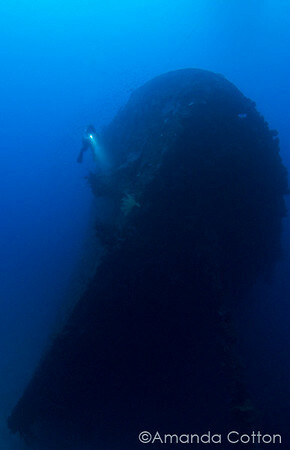 It also helps to have a diver in the photo for large wrecks, to show a sense of scale. Liberty wreck, Bali. This is a huge wreck, but there is no sense of scale. You can tell it's in shallow water from the colors on the wreck. 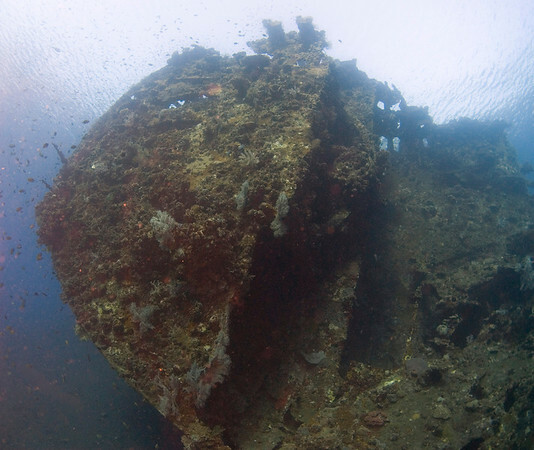 Here we can see the scale of the Nippo Maru wreck in Truk Lagoon. F6, 1/25th, ISO 500, nikon 12-24. Photo by Amanda Cotton. "The Nippo Maru is a fairly large wreck. Getting the entire bow of the wreck and still being able to show detail of the diver was a challenge. Having a very wide angle lens for this shot made it possible."